To outsiders, Washington, DC wouldn’t seem like an obvious home to a large Latin-American population. After all, it’s smack-dab halfway up the mid-Atlantic Seaboard, not particularly close to Spanish-speaking countries, and it’s not Miami or New York -- and most definitely not Houston, San Diego, or Los Angeles. That said, our city’s Latin-American presence is a strong and vital part of our local community, full of everyone from diplomats and international development professionals to line cooks and, um, food bloggers. DC’s cosmopolitan nature means that there are representations of cuisine from North, Central, and South American countries, as well as from the Caribbean. Fortunately for us, these vibrant Latino communities have woven themselves into the DMV fabric, bringing their native recipes and culinary customs with them to make some of the most delicious, nutritious, and authentic food in the area. After weeks of delicious research -- and some surprisingly heated arguments -- we present the best authentic Latin restaurants in DC. Disagree with us? Think we missed a place? Share your thoughts in the comments. "El Tam," as it’s known among its fans, has been making quality Mexican and Salvadoran food in Washington, DC since about 1982. Recently renovated, it's one of the two spots on this list that has really late-night offerings; we’ve seen people digging into pupusas and chips topped high with guacamole as late as 5am. Even more magically, the quality of the food doesn’t falter a bit during the graveyard shift. Come in for a hearty meal, but stay for one of the super-tart (and super-refreshing) house margaritas. A restaurant in a gas station, you say? Put those worries aside, because this place is worth a joyride for the excellent food. Offering a menu comprised of primarily Argentinian, Colombian, and Uruguayan culinary influences, as well as a smattering of menu items from around the world, Fast Gourmet makes some of the best late-night food in DC -- though you’re welcome to enjoy it for lunch as well, as it opens at 11am on weekdays. 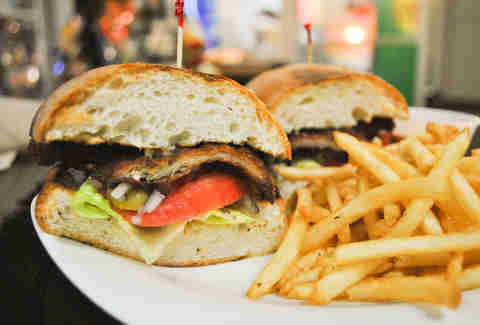 While the Chivito sandwich has been written about by pretty much every publication in town, we’re big fans of the Milanesa -- available plated or as a sandwich, with chicken or beef. 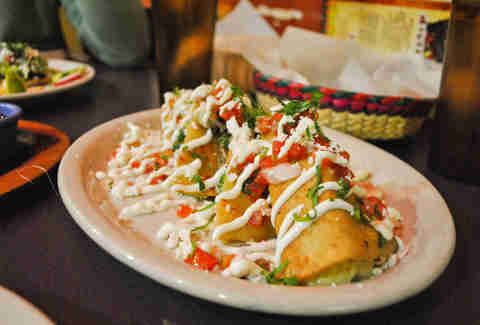 Make sure to order a side of eggplant fries with jalapeño ranch for a taste of authentic Latin American street food. Rumor has it that it'll be building a barbecue pit in coming months, and expanding the menu to include authentic South American asado. 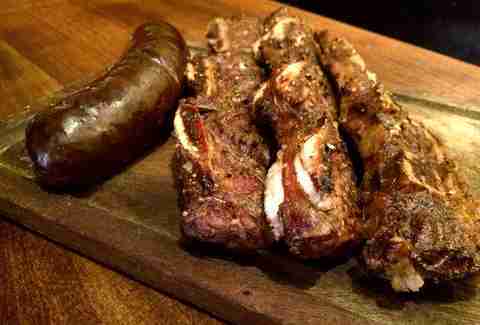 Fact: our mouths are watering at the prospect of some 3am choripan. Some restaurants become synonymous with one dish: the thing they do so well, so extraordinarily better than any of their other dishes or competitors, that it seems kind of silly to go there for anything else. Gloria’s Pupuseria says it all in the name. 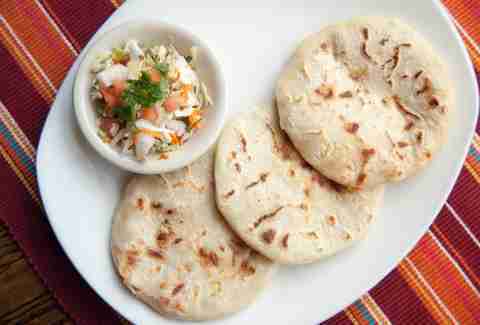 While it does serve a wide range of dishes, its version of the pupusa -- a traditional Salvadoran thick corn tortilla filled with any combination of meat, cheese, beans, and curtido slaw -- stands above the rest. We particularly enjoy the pupusa revuelta, which blends together cheese, crackling pork, and refried beans. Heads up: Gloria’s is cash-only, and no-frills, but if you’re looking for the best pupusas in town, you’ve found them. You’ve probably walked by Judy’s countless times on your way up and down 14th St without really noticing it; we’re not judging, because we did the same thing. Despite its faded, unassuming exterior and wrought-iron bars -- vestiges of the neighborhood’s recent past -- this Salvadoran and Mexican eatery has been putting out affordable, excellent food for a couple decades. Dimly lit and always playing fútbol on TV for the regulars, Judy's makes you feel as though you've been transported to a local eatery somewhere in Central America. But all are welcome here: the staff is extremely attentive, the menu is varied, and the drinks are stiff. We particularly enjoy the chicken fajitas, served sizzling-hot, with fresh homemade tortillas, as well as the heartier brunch offerings: a perfectly cooked, slightly charred strip steak with fried eggs, rice, and refried beans known as Bistec al Caballo. Though this place calls itself a Colombian bakery, the broad offering of authentic, delicious dishes really qualifies it as a restaurant. La Fonda Paisa is one of the few representatives of true Colombian food in the area, and though you’ve got to head out to Silver Spring for these treats, this place is worth a pit stop if you’re on your way to the Fillmore or Merriweather Post Pavilion. As the name indicates, you’re going to find dishes from the paisa region, at the foot of the Andes mountains in northwest Colombia. The vibe is informal and casual, and feels more like a bodega or deli; you place your order at a counter and get a printed ticket number. We suggest having an open mind to try the daily specials -- all reasonably priced, extremely fresh, and incredibly flavorful. 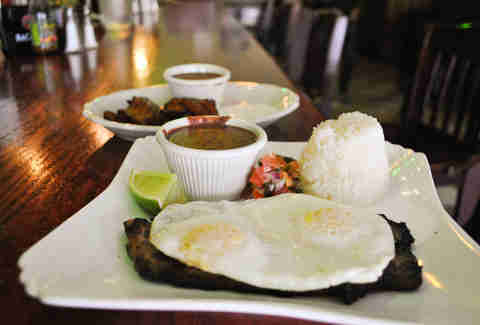 Try the bandeja paisa, a hearty meal consisting of white rice, red beans, black pudding (read: blood sausage), and a hulking slab of grilled or roasted meat -- we had it with the pork, and it was excellent. One of the most endearing aspects of an authentic ethnic restaurant is that it oftentimes doubles as an informal cultural center. These eateries become oases where people can find some respite, enjoying a shared affinity for acquired tastes and flavors; the opportunity to enjoy the music from the old country blaring over the speakers; a chance to break bread over home comforts with total strangers that you’ve somehow known your whole life. There’s always some bachata playing, a baseball game on the TV, and a group of older men and women playing dominoes in the corner at Los Hermanos, a Dominican joint tucked away near the intersection of 14th and Park Streets NW. The buffet varies daily, but you’ll always find a couple staples on hand: plantains, served both green and maduros; hunks of perfectly fried crackling pork, glistening and with extra crispy skin known as chicharrón; and the star of the show, La Bandera, or "The Flag." This dish is the Dominican Republic’s pride and joy, and we can see why -- Dominican-style red bean stew is ladled over mounds of steaming white long grain rice, forming the base of this meal. Typically accompanied by baked chicken, grilled beef, or stewed pork chops, it’s topped off with a green salad, avocados, and twice-fried, crunchy green plantain slices. 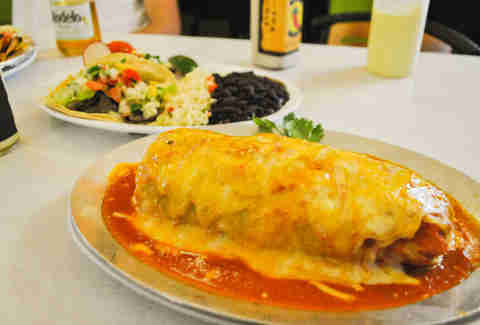 It’s one hell of a meal, and we love the way Los Hermanos serves it. Enjoy a raspberry soda to wash it all down, and cheer on yet another Dominican grand slam. One of the few more upscale restaurants on this list, Nazca Mochica treats Peruvian food as fine art. With a dedicated cocktail menu built around pisco, Peru's national grape liquor, all of the drinks are mixed to pair well with the acidity, smokiness, and citrus profile of the country's cuisine. The house ceviche -- which features a wonderful marriage of textures, flavors, and acidity -- is a true showstopper. Nazca Mochica imports many of the key ingredients, including the blend of peppers, directly from Peru, and all the dishes feature a fine, delicate balance of the subtle, complex dimensions. The kobe anticucho is perfectly tender, with a lingering spiciness and peppery profile that dances on your tongue with each bite, all thanks to the house-made huancaina sauce, a recipe that tastes as if it was passed down lovingly from one generation to the next. We think it’s truly worth the (relative) splurge. Pica Taco makes us happy. An unassuming hole-in-the-wall spot near the corner of Florida Ave and 14th St, this space is always bustling with energy and producing delicious smells that waft onto the street. Infamous for its Toro Burrito Challenge -- a 4lb behemoth that’s free if you can finish it in under 45 minutes -- Pica has a lot of other things on offer that will stick to your ribs. The nachos are made with real cheese and have a nice, crispy broil; the taco platters are a hell of a deal for under $10; and the al pastor is excellent in any vessel or context, the perfect pairing of pork fattiness and the sweet, smoky tartness from perfectly roasted pineapples, onions, and cilantro. Above all, though we love Pica Taco for so many reasons, the No.1 thing that keeps us coming back is the house-made white sauce. Request it. Smother it on everything. Take a bottle home -- you’ll thank us later. El Rinconcito is aptly named, a sliver of a space on what is now one of the busiest parts of town. Obviously an open secret, every table tends to be packed with happy-looking patrons during the lunch rush hour. Yet another Salvadoran-Mexican eatery serving reasonably priced, delicious, and fresh food to a diverse crowd of Washingtonians, this joint offers up excellent classics like the flavorful shredded beef and eggs -- the meat is so juicy, and disintegrates in your mouth with ease. We recommend coming in at off hours, if at all possible; otherwise, you might find yourself waiting a long time for a seat. Rumba Cafe does a little bit of everything, taking inspiration for its dishes from Latin America as a region instead of focusing on any one country’s cuisine. Somewhat surprisingly, they nail it -- chef Angel Gustavo Huapalla’s restaurant has been going strong for close to 20 years at this point. We enjoy the asados from his native Argentina, but our favorite was the seafood paella: a classic coastal dish, Rumba Cafe’s version was brimming with scallops, squid, shrimp, and mussels, all swimming in a peppery tomato broth and yellow rice. 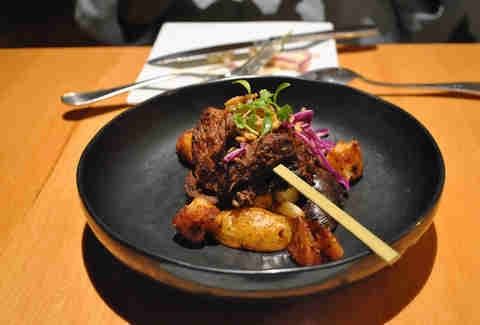 It's a standout rendition of one of the legacy dishes shared by most Latin American countries. Starting off as a food truck, El Chilango continues to bring its taco goodness to the brick-and-mortar location right off the U St Corridor. If you’re looking for much beyond tacos, you’re out of luck; these guys keep the menu lean and focused. The lengua taco is perfectly cooked and textured, and there’s a beautiful simplicity to the cheese and avocado taco, which is exactly what it sounds like. El Chilango serves tasty house-made horchatas and aguas frescas, the perfect pairings to wash down three (or four or five) of their delicious tacos, which can be slightly on the smaller side -- but are packed with flavor. Taqueria Habanero’s mushroom quesadilla is probably one of the best dishes we have eaten in the District -- complex, nutty, and almost reminiscent of truffles, an incredible feat for a place where the average dish price is under $10. The tortilla was lightly fried and never overwhelming with grease, and the fresh cotija cheese and tomatoes added a cooling, creamy texture balance. 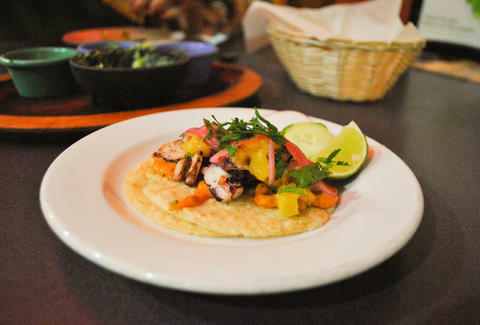 The octopus taco, featuring chipotle aioli and mango salsa -- a recent taco of the day -- is tender, with amazing smoky flavor and served on fresh flour tortillas that truly stand out from the pack. The owners, husband-and-wife duo Dionicio Montero and Mirna Alvarado, worked with José Andrés for close to 20 years before opening up their humble eatery in 2014, and the haute cuisine abilities and attention to detail show up in every dish. We’ve never seen this place at anything but capacity occupation, for obvious reasons: this is outstanding food at affordable prices. Jose Lopez-Sanchez is a writer, comic, and second-rate Drake stunt double from the Dominican Republic. You can read more of his work over at Brightest Young Things. Follow him on Instagram @jlopezsanchez for blurry concert photos.